Less than TWO WEEKS until Dare releases! Hence this blog post on Wednesday instead of Tuesday as I originally intended. When I started revising Dare, I realized I needed a better picture in my mind for King Respen’s castle. At this point, I hadn’t even named the castle. I knew I wanted a castle with a large, noticeable tower. So I googled “castle with a large tower” to see what ideas I could come up with. And that’s how I stumbled onto Raglan Castle in Wales. It wasn’t much to look at first. The Great Tower set off to the side had been bombarded into rubble several hundred years ago. The castle is still in ruins, not like some of the magnificent, restored castles seen in travel brochures. But as soon as I saw it, I knew I had the perfect castle for Dare. I googled it and spent a long time looking through pictures. Even better, there was a virtual tour of Raglan Castle online done in pictures that walked me step by step through each part of the castle. I went through the online tour, took a lot of notes, and printed off a lot of pictures. 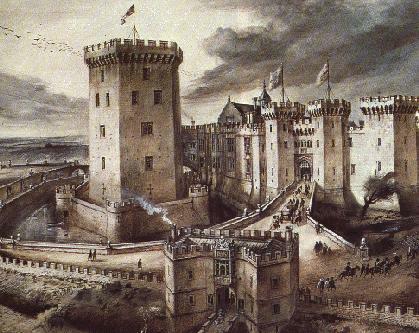 The website for the castle also had an artist’s sketch that showed what Raglan had probably looked like before it had been bombarded into rubble. A five-story Great Tower set apart from the rest of the castle? Perfect! The in depth tour online and the abundance of pictures gave me the visuals I needed to create King Respen’s castle, which finally got the name Nalgar Castle. I made a few tweaks to the layout of Nalgar vs. the real Raglan Castle, but much of it remained the same. That’s so neat! I love that giant tower! I know! I took one look at it and knew it just had to go in a book!